Dave Doty photographed the bowl on the left, it is blue and sold again in 2007 and again in 2014. 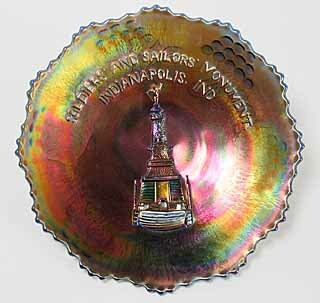 On the right is the only other reported piece in the pattern, a 7-inch blue plate. It sold at the Seeck November 22, 2003 auction of Dr. Jack Adams' glass. 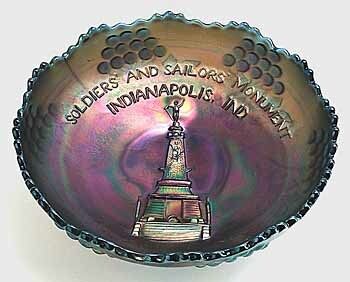 Like the Indiana State House and Illinois Soldiers and Sailors Home patterns, this has Fenton's Berry and Leaf Circle on the back.